A beef on weck is a sandwich found primarily in Western New York State, particularly in the city of Buffalo. It is made with roast beef on a kummelweck roll, topped with kosher salt and caraway seed. The meat on the sandwich is traditionally served rare, thin cut, with the top bun getting a dip in au jus and spread with horseradish. The origin and history of the beef on weck sandwich is not well established. It is believed that a German baker named William Wahr, who is thought to have immigrated from the Black Forest region of Germany, created the kummelweck roll while living in Buffalo, New York. Wahr may have based the kummelweck roll on a special loaf left as a ceremonial offering for the dead known in Swabia as Schwäbische Seele, which is a thin roll resembling a baguette that is topped with salt and caraway seeds. The sandwich's creation is estimated to have taken place some time in the mid-19th century, according to a butcher in Western New York. The kummelweck roll (sometimes spelled "kümmelweck"), topped with kosher salt and caraway seeds, gives the sandwich its name and a distinctive taste. Kümmel is the German word for caraway, and Weck means "roll" in the south-western German dialects of Palatinate, the Saarland, Baden and Swabia areas (northern Germans generally say Brötchen). However, the roll used for this American sandwich tends to be softer and fluffier than a standard German Kümmelbrötchen or Kümmelweck. In Austria, a similar type of small white-bread is known as Kümmelweckerl (diminutive from Wecken, which refers to a whole big bread, i.e. Brotwecken). 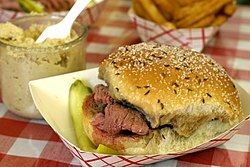 A typical beef on weck is made from slow-roasted rare roast beef that is hand-carved in thin slices, served on a kummelweck roll. The cut face of the top half of the roll may be dipped in the jus from the roast. Prepared horseradish is usually provided for the diner to spread to taste on the top half of the roll. The beef on weck has long been popular regionally, and has gained a following in other areas of the United States where it has been introduced. Expatriates from Western New York have taken the dish and brought it to other areas after relocating. For example, PJ's BAR-B-QSA in Saratoga Springs in Eastern New York is noted for its beef on weck. It has also been featured by chefs on cooking shows including the PBS special Sandwiches That You Will Like. Bobby Flay, Anthony Bourdain and other chefs have featured the beef on weck, or a variant, on their television programs. The American restaurant chain Buffalo Wild Wings was started by former residents of the Western New York area and the original name of the restaurant was "Buffalo Wild Wings and Weck", abbreviated as "BW3", the third W referring to weck. Some still refer to the company with the extra "W" in its abbreviation. The chain now serves an updated version of the beef on weck called the Thirty-Fifth Weck Sandwich. The Daily Meal reviewed the beef on weck as a "roast beef sandwich that dreams are made of" in their article "12 Life-Changing Sandwiches You've Never Heard Of". ^ "Beef on Weck: A Locally Famous Sandwich, Upgraded". BuffaloChow.com. Archived from the original on 2009-08-31. Retrieved 10 October 2009. ^ a b "History of Beef on Weck". The Kitchen Project.com. Retrieved 10 October 2009. ^ a b c Ekfelt, Lynn Case (Spring–Summer 2003). "Buffalo's Other Claim to Fame". Voices Volume 29. The New York Folklore Society. Retrieved 10 October 2009. ^ "Zombies, beer, and Buffalo's favorite sandwich". The Buffalo News. October 30, 2009. Retrieved September 3, 2015. ^ Carey, Elizabeth (November 20, 2017). "For Charlie the Butcher, plenty of reasons to give thanks". The Buffalo News. Retrieved November 20, 2017. ^ a b c Oleniacz, Laura (August 2, 2006). "What the heck is beef on weck?". Star News Online. Wilmington, NC. Retrieved 10 October 2009. ^ Stradley, Linda. "Beef On Weck Sandwich - History of Beef On Weck". Whats Cooking America.net. Retrieved 10 October 2009. ^ Murdock, Andy (October 19, 2012). "A field guide to 20 great American sandwiches". CNN.com. Retrieved September 3, 2015. ^ Levine, David. "Saratoga Days". Hudson Valley Magazine. Retrieved June 10, 2016. ^ Flay, Bobby. "Beef on Weck recipe". Food Nation with Bobby Flay. Food Network.com. Retrieved 10 October 2009. ^ "Company History" (PDF). Buffalo Wild Wings. 2012. Retrieved September 3, 2015. ^ "Thirty-Fifth Weck Sandwich | Buffalo Wild Wings® Menu". www.buffalowildwings.com. Retrieved 2017-10-17. ^ Myers, Dan (27 February 2015). "12 Life-Changing Sandwiches You've Never Heard Of". The Daily Meal. Retrieved 2015-02-28.